Spring Summer collections saw the timeless battle of function versus aesthetic. Taking the practicality of androgynous styles and infusing them with femininity, allowed designers to flourish on this season’s catwalks with structured designs. The oversized pockets, layering of styles, textures and shapes & that sense of coolness. Queue Stella McCartney and Victoria Beckham. This Spring Summer, it’s hard to avoid the obvious lingering of opulence and the statement of contrast in lavish textures and clashing prints. 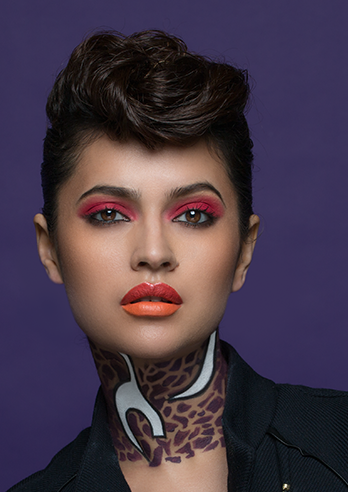 With African lifestyles hugely influencing the runways, Kryolan’s SS’16 Trendlooks diverge into this culture in a creative look that explores the unexpected. The self indulgent, expressive, dramatic designs were born straight from the heart of culture into an ultra graphic presentation. Make-up is an art. Art is a make-up. Either way round, the inspiration and connection between art and make-up is paramount. Using a gouache, oil painted impression for the lips, ultra graphic lines and the body paint patterns Kryolan’s SS’16 looks infuse the energetic, individuality of artworks. The ultra graphic lines, a nod to the likes of Dolce and Gabbana, Prada & Missoni showcase an underlying influence of the traditional, ceremonial African tribal markings empower the model with individualism and strength. In body art, a model can be seen as merely a blank, living canvas, allowing beauty to be unveiled in an artistic, creative form not always expected. One thing is for sure Prints & Colors as well as Lines & Strokes demonstrate how Kryolan products give the freedom to experiment; do you dare to create something exuberant? Make-up Artist: Paul James Merchant & Gemma Horner | Photographer: Marc Hayden.